Belonging comes in many different forms. We belong to families. We belong to communities. We belong to churches or temples or mosques. We belong to schools, or health clubs. We belong to Meetup groups and Facebook groups. We belong to work groups and workout groups. Belonging is something that we all seek out as human beings. Sometimes we belong to aclub to find people with similar interests and goals. Other times, we join to have access to something we are passionate about from religion, to movies, to golf, to tennis, to books or cookbooks. If you love to take spinning class, you join a spin studio. If you’re a tennis lover, you join the tennis club. Until recently, you didn’t have a place to join if you loved to ski. You rounded up your ski loving friends and tried to coordinate a time when everyone could get to the mountain together and after emails and texts back and forth you eventually all found yourselves at the end of the long lift line worn out just from figuring out how to get everyone together. If you truly love to ski, and you want to easily hit the slopes with your family or your ski crew, then joining a club like The Hermitage Club makes a lot of sense. Adirondack Chairs around the large stone hearth at the base of the mountain and just outside the clubhouse at The Hermitage Club in Dover, VT.
You know those friends you hear talking about their time share that they bought into once? They are always trying to find a time to fly out to it and use their allotted time and instead of a luxury it sounds more like a chore. The Hermitage Club is in Southern Vermont. It is an easy drive from Boston that takes just over 2 1/2 hours. The Hermitage Club is not far from New Hampshire, Connecticut, New York and Maine so wherever your friends live it’s easy to meet at the club for the weekend. No flights need to be coordinated, unless of course you choose to fly into their Deerfield Valley airport. Tradewind Aviation offers charter shuttles from White Plains and Farmingdale, NY which will get you on the slopes in about 45 minutes. When you go to some of the larger ski hills, that same hustle and bustle that you experience back home, at school, at work, in the city is right there with you. There are impatient parents waiting to get their ski rentals. 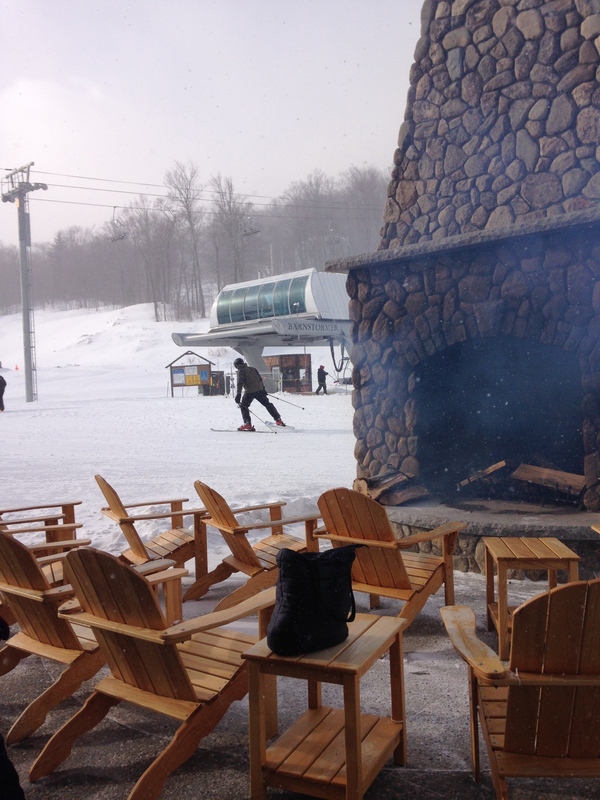 There are teens hanging out on all the benches by the fire pit because there’s nowhere else for them to go when they are done skiing. There are tots melting down because they want to sit by the fire and get warm but all the spots are taken up with people’s stuff strewn about. There are skiiers knocking into you as they take over an entire table with their mega bag of gear. Almost like magic, at The Hermitage Club time slows to a comfortable pace, no hustle, no bustle, no rush or hurry, unless of course you’re zipping down the slopes. There is plenty of space and plenty of time, because it has got a clubhouse feel. It’s your home away from home. No one is pushing past anyone to get to anything. The truth is, you can get in as many runs as you like not only because there are no lines, and fewer people on the slopes, but also because if you need a bite after lunch is over, or you need a different boot or ski, or the kids want a break for a few minutes to warm up, the service at The Hermitage Club is flawless. 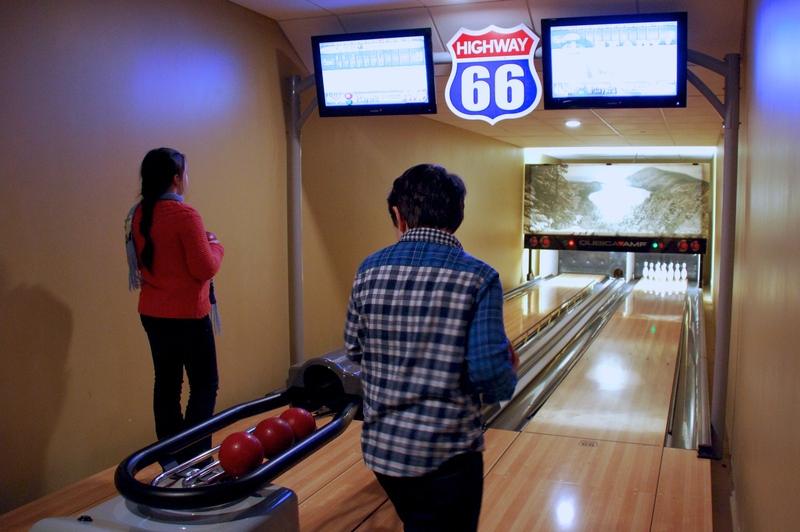 The staff are happy to help because they are catering to a smaller group of people, no one is cranky, or overwhelmed, even the tired children can head down to the family center to catch a movie in the viewing room, play some air hockey, play in the arcade or bowl a few strings. Cabin at the top of the mountain. 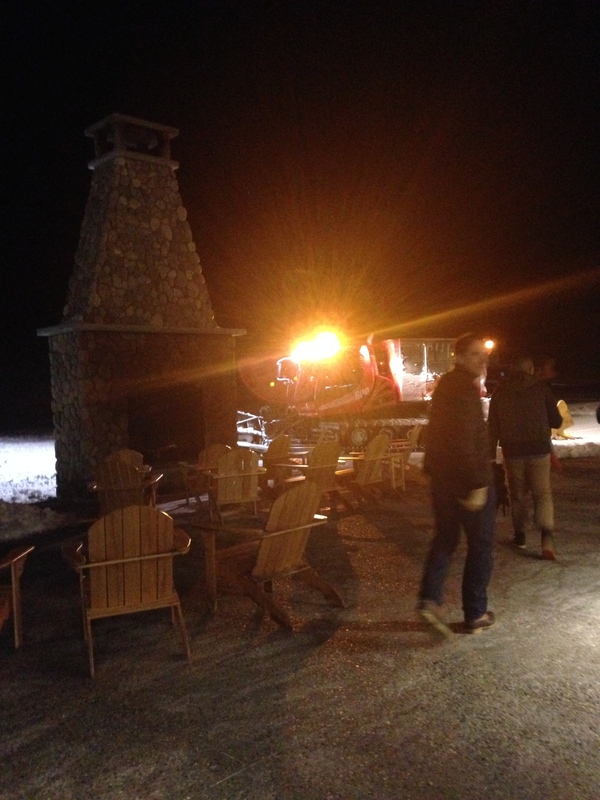 We took a Snowcat to the top of the mountain for cocktail hour and dinner. A few of our dining companions chose to take a little night ski down after the meal. That, in a nutshell is the joy and freedom of being a member at The Heritage Club. The flexibility of Snowcat rides, private parties on top of the mountain, and post-dinner night skiing after. The ability to do things that are just not possible at your average mountain. The little things really matter. The big things are all icing on the cake and the cherry on top too. What makes a weekend great is relaxed family time, relaxed grown-up time, and luxurious solo time. What makes a weekend or vacation amazing, are all the extra special touches. Not only that, when you belong to a club you can plan special events and celebrate milestones in unique ways, because the staff will help you put together something fabulous. Just about anything is possible, whether it’s a snowcat ride at dusk to the top of the mountain for cocktail hour in a heated cabin with the girls, a special birthday breakfast with waffles and hot chocolate at the Hermitage Inn followed by skating, tubing and s’mores over a fire, or a guided snowmobile ride to the top of the mountain just in time to see the sun set. From sippy cups to rocks glasses. There is room for everyone at the club. 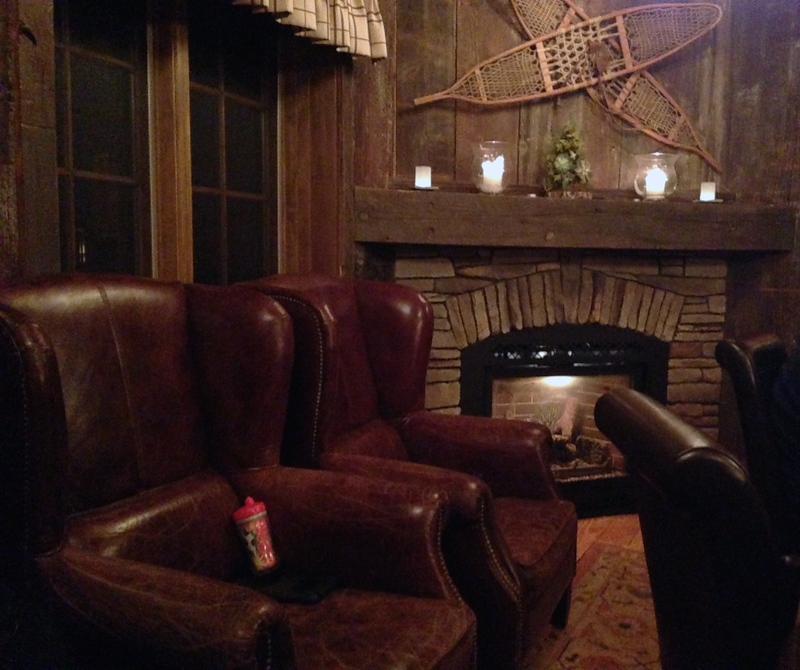 Heated cabins at the top of the mountain to warm up in and grab a snack. You know your favourite hotel that puts out coffee, hot chocolate, milk and cookies every day at 4:00 o’clock, or cheese, crackers and sherry for cocktail hour. It is kind of like that but in a cute little cabin at the top of the mountain. 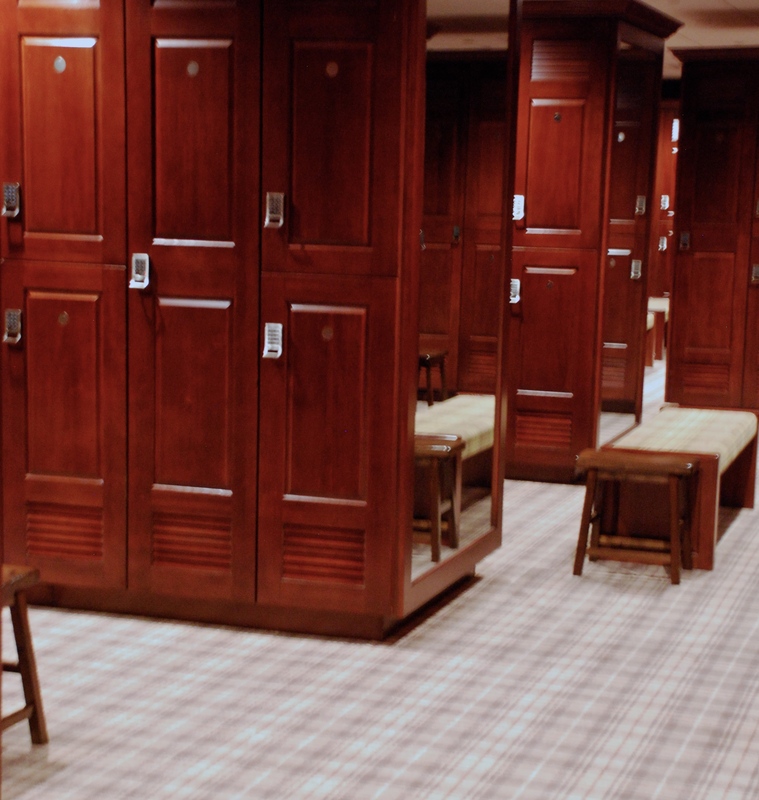 Member locker rooms and guest locker rooms with plenty of space for all your family’s and guests’ gear. Member lockers all have boot warmers built into the locker. 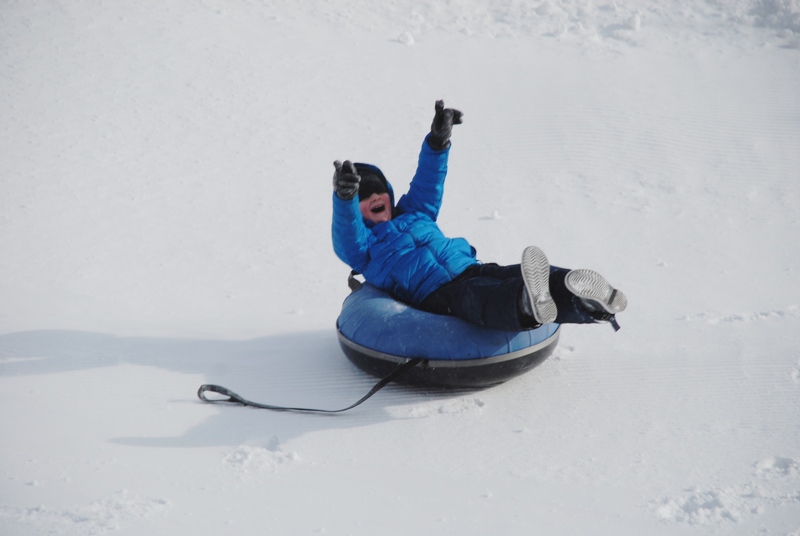 Beyond skiing (both Alpine and cross-country), there is tubing, skating, snowmobiling, sleigh rides and snow shoeing. There is an Alpine racing training program, as well as junior, teen and masters seasonal programs. For those who can’t or won’t hit the slopes for whatever reason, there is a spa, a two lane pool, a spin studio and a fitness center with yoga, sculpt and spin classes daily. There are hot tubs and an 8 person sauna with a 42″ flat screen TV in case there’s an important game on or you want to have a little screen time of your own. Shoot some pool and have a cocktail in the Game Room where there is also a 52″ TV, a beautiful fireplace and a selection of games including, chess, checkers and backgammon. A gorgeous clubhouse with a fireplace the size of a cute warming hut and lounge seating on three sides with dining tables on the fourth side. There . T.
Several dining options including the Chef’s Kitchen, express lunch buffet, full buffet, and a truly impressive shellfish tower (or rather mountain of shrimp, king crab legs, and more). 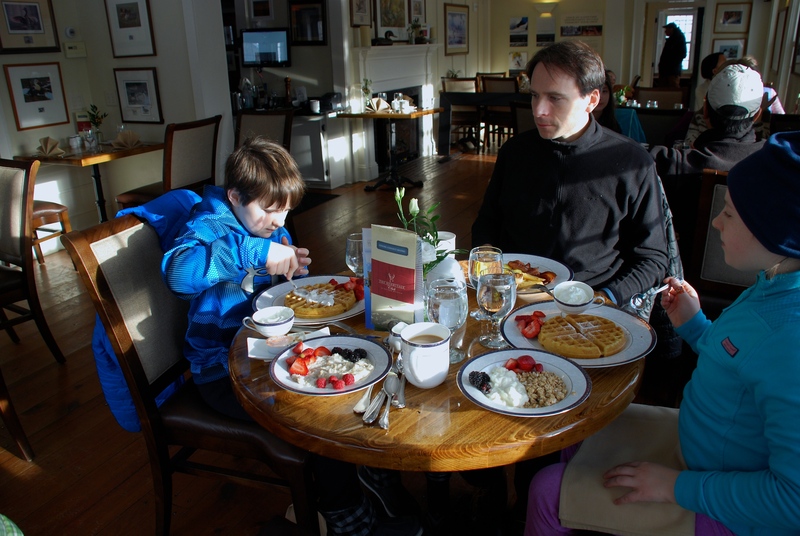 Breakfast, lunch, après ski, and dinner are served at the clubhouse daily except Sunday night dinners which are served at The Hermitage Inn. Several lodging options. 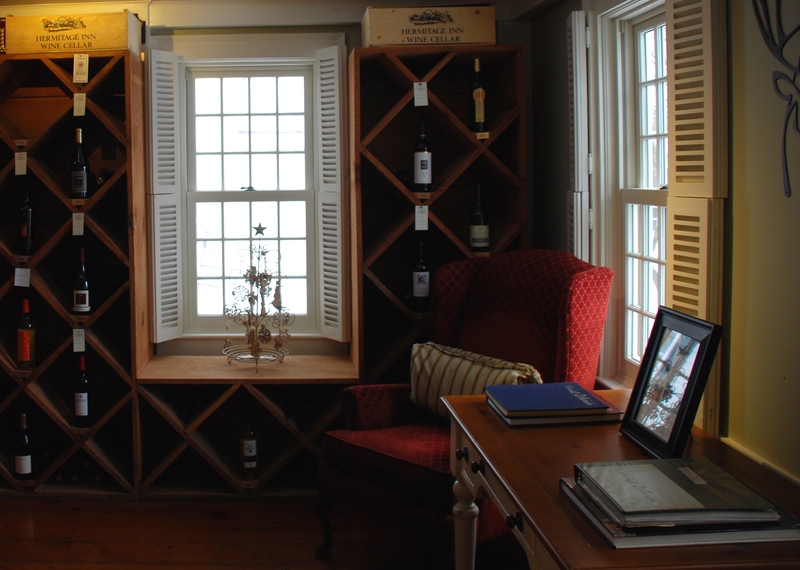 The Hermitage Inn, The White House, and The Vermont house each have their own special feel and are run by The Hermitage Club, which has a total of about 100 rooms for guests and members. In addition The Hermitage Club is building a hotel that will be ready in 2016. Or, if you want a more permanent residence by the mountain visit The Hermitage Club’s real estate section to see all the options. Summers at the Hermitage club include golf, boating, swimming, kayaking, stand up paddle board, fly fishing, biking, hiking, and guided 4×4 ATV rides. Most ski lodges have one great dish. Some cafeterias has a chili that everyone loves or they do a pretty mean pizza, or maybe they have a minestrone that mom loves. After a while though, one good dish doesn’t cut it. The Hermitage Club has exactly the food that everyone from the smallest toddler, and most temperamental teen to mom, dad, grandma and grandpa is looking for to keep them well fed for the day. The Chef’s Kitchen has pizza, pasta, chicken nuggets, soups and chowders ready to grab and enjoy in the dining room. Once the children are happily eating, the grown ups can choose from a delicious array of salads, sandwiches, fruit, and cheese from the express buffet or fuel up on something a little hardier from the full buffet which has everything from grilled chicken, brisket, and ribs to tacos. After lunch, the dessert table is definitely a big draw for those who have a sweet tooth, and the coffee, hot chocolate, and tea station in the smaller dining room is open throughout the day. It is rare that on any given day every family member and guest wants to do the same thing together all day. Because of the tight knit community of The Hermitage Club and the wonderful staff, families can have more flexibility. Children can have a little more freedom. Little ones can play in the childcare center while older ones head to ski school or hit the slopes with mom while dad works out in the fitness center. Families can gather on the couches around the fireplace inside the clubhouse and check in or just meet at the end of the day for dinner. Mornings are quick too thanks to the ski valet, your skis can be ready and waiting for you upon arrival. I know you don’t really think of value when you think of a private club. You think luxury and high price tags. But, on the other hand the quality time you spend as a family especially if you have a very busy work week and daily life, is worth a whole lot. The Hermitage Club membership is on par with a country club membership. If you compare it to the cost of buying and maintaining a vacation home or a time share that you never use, a gym membership you don’t have time to get the benefits from, and family vacations, then membership all of a sudden makes sense. A family legacy membership is $65,000 which is a one time expense. An additional $25,00 to $75,000 can be added for private residency membership. Membership includes, skiing, skating, snowmobiling, golf, fishing among other things. Dues are $5600 (family) or $2800 (individual) annually. I think perhaps every generation says this and each generation is probably right. Raising children in this day and age is tough. Being a child in this day and age is perhaps even tougher. Whatever the reasons, quality family time is hard to find. If you have a place to go where everyone can slow down, find space, and come together then you will all benefit not only individually but as a family unit. We can all benefit from a lot more time enjoying the great outdoors. Finding a place where children can have a little extra freedom is priceless. A weekend where couples can have time to sit together and reconnect, get in a much wanted workout, or finding time to schedule a massage without worrying about childcare benefits everyone. When you’re a member of somewhere like The Hermitage Club there is less to plan and figure out. Before heading to the mountain no one is counting skis, snacks, planning meals, packing activities, finding the movies that are missing from the cases. It is all taken care of. It is all already set for you at the clubhouse. The freedom and flexibility at The Hermitage Club makes it easy to have quality time together but also independent time for tweens, teens and little ones. There are great teacher to child ratios for childcare and ski school. Solo time and family time flows easily throughout the day. Our ride has arrived to take friends and family up to the top of the mountain for a private chef’s dinner in the cabin. Let’s take this Cat-illac for a ride. Just like family, finding time to spend with even some of your closest friends can be hard. We’re all busier than we’ve ever been before. Work piles up and our schedules are jam packed with hockey games, dance rehearsals, school events, and work dinners. Bringing friends along to The Hermitage Club for a weekend away is the perfect way to catch up, have an active weekend, and raise a glass or two together. Members can buy guest passes, there are guest locker rooms, and if you really must get a little work done too, there is a full service business center. With 100 rooms on site and in town, there is plenty of room for everyone to stay and guests can rent gear if they need to as well. The Hermitage Wine Cellar at the Hermitage Inn. As our online communities grow, our real life communities seem to shrink or be more fickle. In general, women do a pretty good job of staying connected to different groups and communities. It seems though that for men and dads it is harder once the kids get older to belong to a group but it’s so important. Yale psychologist Professor Paul Bloom states, “The key to the happy life, it seems is the good life: a life with sustained relationships, challenging work, and connections to community.” Fewer people are active members of a church or temple, the country club isn’t for everyone, so The Hermitage Club offers a built in community of people who enjoy family time, the great outdoors and appreciate the quality of time spent together. Seeing the same familiar faces each weekend creates an automatic community that you can belong to year after year. Looking back towards the mountain and town from The Hermitage Inn. What is unique about The Hermitage Club, is that it’s not a superficial little village that popped up overnight, or an old town razed to the ground with cookie cutter new construction plunked down on a plot of land. The Hermitage Club is Deerfield Valley revitalized. It has the charm of a quaint Vermont village because it is at the heart of an actual Vermont village. The towns of Wilmington and West Dover are tucked in right next to the mountain and clubhouse with cute shops and houses. The Vermont House, for example is one of The Hermitage Club’s properties in town, was once a stagecoach stop and sits right in the center of the old village. The Mercedes Sprinter will shuttle you the short 5-10 minute ride from town to the clubhouse. The town of Wilmington has two parts. There is the charming old Vermont town center with local business, some that have been here for many years, and others that are being revitalized by the club itself and the newer part of town with larger shopping centers, a pharmacy and more local businesses like Blue Mountain Produce (the Vt. version of a Citarella or mini Whole foods). It isn’t so small that you can’t pop into a full size grocery story to get something you forgot at home, but it isn’t so big that you need to pull out the GPS to figure out where you are going. The Hermitage Club itself is set on beautiful Haystack Mountain and has the bucolic Hermitage Inn right next door to the mountain and clubhouse with tubing, cross-country skiing, snowmobiling, and skating set right outside the inn’s door. The Hermitage Club is located at 10 Gatehouse Trail in West Dover, Vermont. To find out more about membership or plan a preliminary visit to the club, you can call (802) 464-7734 or sign up to speak with someone from the club online here. Not your average milk and cookies. Just one small part of the dessert table that is set out at lunch time. It’s not an indulgence after you’ve spent the entire day skiing rather than waiting in line. An array of fresh fruit, sandwiches and salads are parer of the Express Lunch. A mountain of shrimp and shellfish at lunch in the clubhouse at The Hermitage Club. Dining in the clubhouse is a treat and a great value. Lunch off the express lunch table includes salad, salmon, grilled chicken, and beautiful displays of fresh fruit, cheese and crackers, and wraps. Breakfast at The Hermitage Inn. Getting lunch in the Chef’s Kitchen. 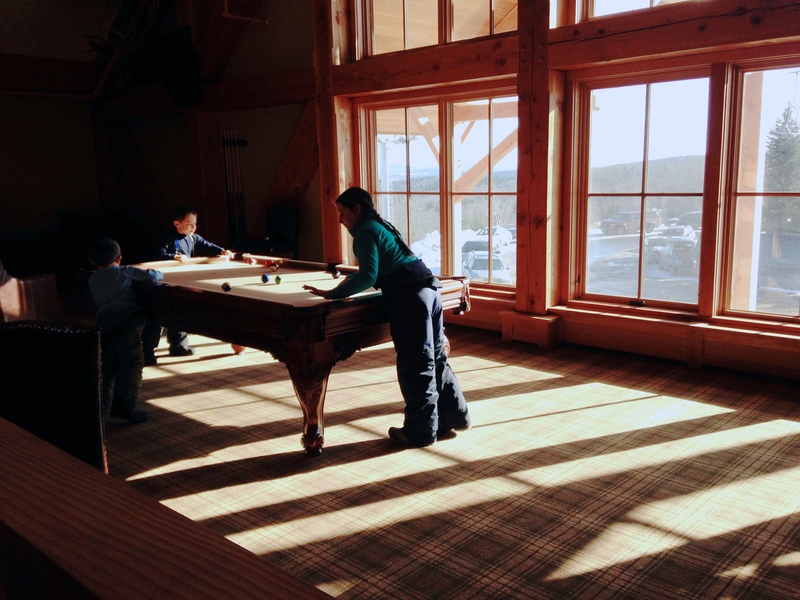 Play pool as you watch the children go by overhead for the 20th ski run of the day. Dine downstairs in the Clubhouse or on the second overlooking the mountain. The Clubhouse at lunch time. It’s quiet and relaxing. Not the usually loud, crowded ski lodge experience. After you get fitted for your gear, you can check it in with the Ski Valet and they’ll always be waiting for you at the base of the ski lifts just outside the clubhouse. Mornings at The Hermitage Inn. 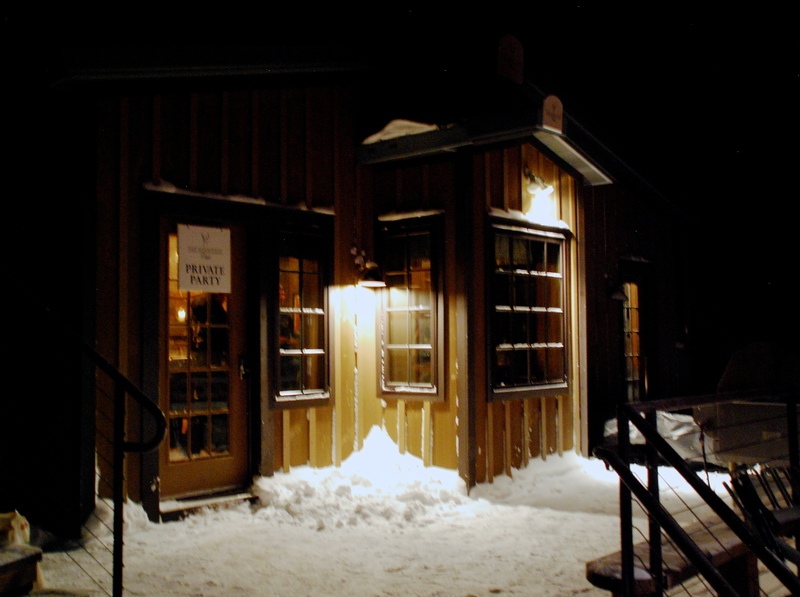 The bar will be waiting for you and your friends after your day out on the Nordic trail or a late afternoon snowmobile ride. Coming soon: The Hermitage Club is putting in a heated high speed bubble this summer so the ride to the top will be swift and super cozy for the next ski season. Corduroy everywhere you look and all day long from dawn to dusk. The skates are nice and warm waiting for you in the cabin and the skating rink is the perfect size to enjoy with family. Warm up by the fire in between games of hockey or skating around the rink. Skiers entrance at The Hermitage Inn. Spacious shower in the washroom for guests. From sinks and changing rooms, to water bubblers throughout the clubhouse, every detail is done beautifully and with members needs in mind. 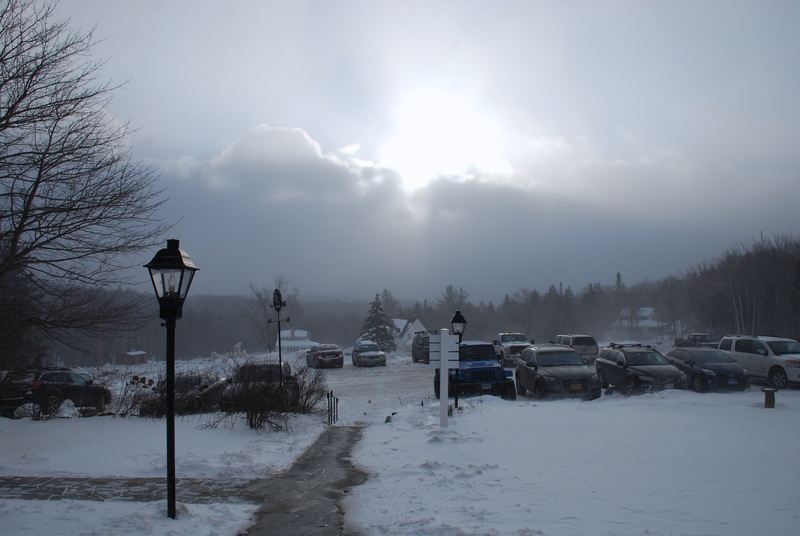 Looking out towards Dover, VT from the entrance of The Hermitage Inn where the skating, tubing, snowmobiling, and snowshoe trails are located. Covered Bridge entrance at The Hermitage Inn. Bill and Will enjoying breakfast just outside The Hermitage Inn. The full fitness studio has a workout room as well as a spin studio, two group exercise studios, a two lane pool, and hot tub. Your ride as arrived. For a special occasion, take the Cat-illac up to the top of the mountain for dinner. Dining at the top of the mountain in the warming cabin. During the day skiers can come in to warm up before their run down the mountain a table is set with cookies, granola bars, and other treats. By evening, it is transformed for a private party. Cocktail hour, fondue and appetizers and a three course sit-down dinner. The Hermitage Club is welcoming unlike some other clubs, there are just a few rules to make everyone enjoy their time. That would have been so fun! I was really impressed.